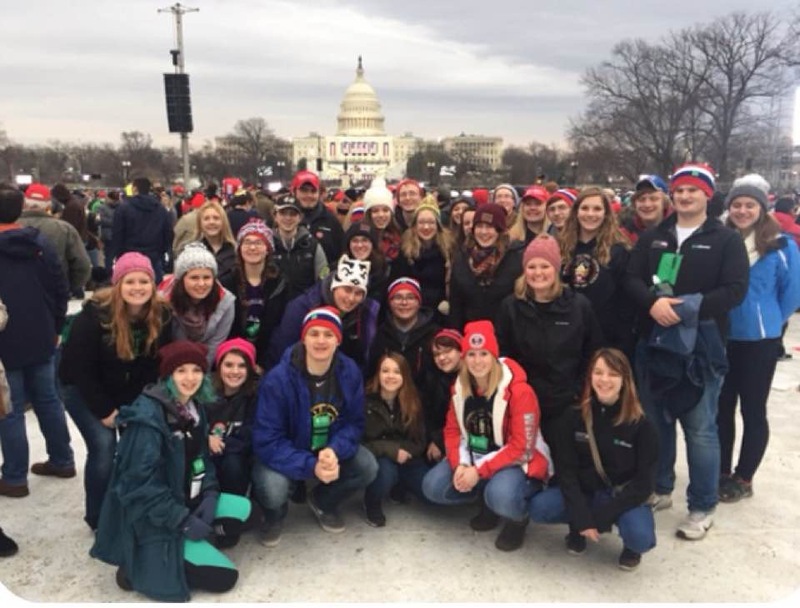 Libby Willkomm, a West High sophomore, Luke Schowalter, an East senior, and nine other 4-H students from Washington County joined up with 500 members from across the country for the Citizenship Washington Focus Presidential Inauguration experience. Starting Jan. 17, these students spent five days attending both the inauguration and the protest march while taking part in a multitude of other activities around D.C.
Willkomm, Schowalter, and the 28 other students from the Wisconsin 4-H delegation woke up early on Jan. 20 to join the hundreds of other 4-H members in a crowd of thousands of people to witness the inauguration. They may not have had the best view, but nonetheless they agreed that it was an amazing experience. This experience was a nonpartisan event designed to expand students’ knowledge about government and, more specifically, the executive branch. Students were required to commit to this trip by last January. The trip was entirely educational and intended to offer students multiple viewpoints on national politics, no matter what the outcome of the election was. However, the inauguration was far from their only focus during the experience. Throughout the week students took part in numerous activities dealing with the workings of the government and giving students a perspective on how it all works. 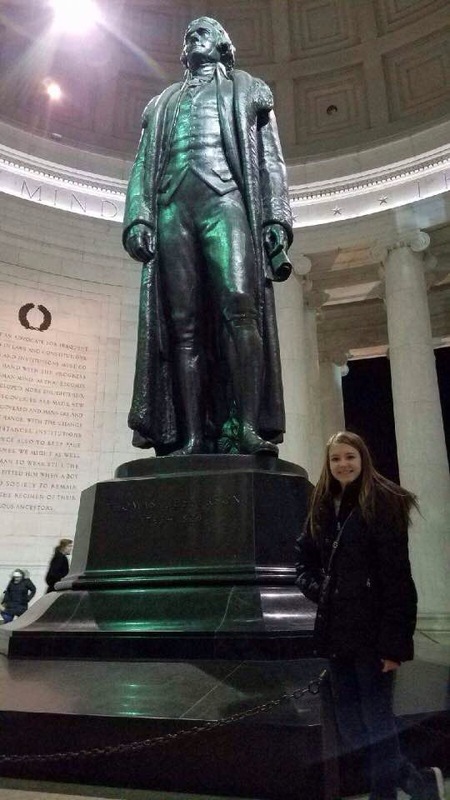 Libby Willkomm at the Jefferson Memorial. During the trip the students had opportunities to participate in mock governmental events, including a town hall meeting, and a mock-presidential election among the hundreds of students at the 4-H convention center. Towards the beginning of the experience the students were sorted into two main political parties and a third party. Students then decided if they wanted to run for president. Candidates made campaign speeches, and then held a caucus in order to select the top candidates from each party. Finally, after registering to vote, students picked their favorite candidate. On the evening of inauguration day, students enjoyed a river cruise with dinner and a mock-inauguration ball where the winner of the mock-election was announced. The students also took a monument tour, saw the National Archive, and went to the Newseum, a museum dedicated to the media’s influence on the government. “I thought that was super cool, learning what how much the media impacts our government and our lives,” Schowalter said. Additionally, the students had the opportunity to hear numerous speakers. Among them were Barbara J. Stephenson, the president of the American Foreign Service Association; Tim McBride, the special assistant to President George W. Bush; and Anita McBride, the former White House Personnel Director for President Ronald Reagan and George W. Bush. The students on this trip truly had a packed schedule. When they were not doing any of the above mentioned activities, they could be found doing community service at the University of Maryland. This was the first time 4-H offered this inauguration experience, although every summer they offer a similar trip that is focused on the legislative branch. Stapleton-Welch felt that the trip was successful, and she was very impressed with her students’ maturity and willingness to learn. 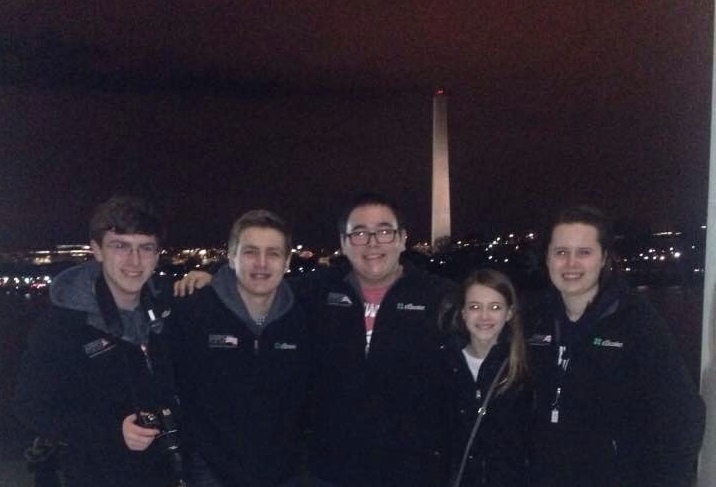 Standing in front of the Washington Monument, from left: Riley Smeaton (Arrowhead), Nathan Schmidt (Germantown), Luke Schowalter (West Bend East), Libby Willkomm (West Bend West) and Mariah Mihm (Slinger). I ask once again, Libby – where’s the love for APGOV??! Thanks for sharing your unique experience with our class and the general public. I hope you grow to love Washington, DC as much as I do!